Our New Jersey restaurants ratings and reviews have been established on the basis of a combination of many sources. Click here for an explanation on how we rate restaurants. 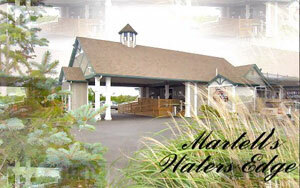 This is the place you come to if your enjoy a water front view with decent food and a live band every night. They also have a dock for boaters who wish to dock and have dinner, and an outdoor Tiki bar for the summertime. Their inside dining menu consists of a variety of well prepared seafood, meat and a few pastas dishes. During the summer months, they open up the outdoor dining area and offer a raw bar and a variety of sandwiches, sushi, salads and wraps. The service however, tends to be very inconsistent. They also host weddings, private parties, and is a good place to go for holiday Sunday Brunches. It is off of the main road and may be difficult to find, so be sure to take careful directions. A GPS is recommended. For Inside dining starters, the popular choices are: Water's Edge Crab Cake with Maryland crab and vegetables served with a Cajun remoulade, and the Tempura Battered Ahi Tuna Roll with Soy-ponzu dipping sauce, wakame salad, wasabi, and pickled ginger. For inside dining dinner entrees, the popular choices are; The Classic Fillet Oscar with Jumbo lump crab topped grilled Angus fillet, lemon-herb hollandaise sauce; the Cedar Plank Roasted Atlantic Salmon with Smoked bacon cedar wood wrapped north Atlantic salmon, honey lime bbq sauce; and the Grilled Porterhouse, a 24 ounce southwestern dry rub grilled black steer topped with roasted garlic butter, served with crispy yucca chips and lemon garlic dipping sauce. Subscribe to our free monthly newsletter. Receive notice of upcoming events, seasonal places to visit, and restaurant information. I promise to use it only to send you New Jersey leisure guide news.